Teeth whitening will brighten your smile, but it can cause teeth to become sensitive to heat, cold and pressure. This is especially true for bleaching agents found in teeth trays. With teeth trays, the peroxide in the bleaching agent is often highly concentrated. When peroxide interacts with teeth for extended periods, it may reach past the enamel and into the dentine and cause irritation. That is why you are looking at that delicious ice cream with longing and fear. So how can you get a beautiful smile without living through the misery of tooth sensitivity? Start using toothpaste and other dental products with ingredients for sensitive teeth. This will build up your teeth's resistance to the effects of the teeth whitening gel. The dentist will be happy to prescribe medicated toothpaste or a dental gel used to reduce tooth sensitivity. Keep using this toothpaste or gel throughout the teeth whitening process as well as for a few days after the procedure. The teeth will most likely be sensitive to heat, cold and pressure. This means you should limit the teeth's exposure to these things. For a few days after each whitening procedure, consume only foods or drinks that are neither hot nor cold. Be sure to avoid sugary and acidic foods as well. To deal with your teeth's sensitivity to pressure, be gentle when brushing your teeth. You should get a toothbrush with soft bristles and use lukewarm water to avoid pain. Drinking straws will direct liquids right past the teeth and to the back of the throat. This will keep hot or cold liquids from your teeth as well as sugary drinks. The active agents in teeth whitening gels are peroxide-based compounds. Many people choose the most powerful teeth whitening kits they can find — ones with the highest percentage of peroxide. In high concentration, peroxide compounds will go past the enamel and into the dentine, and that is how teeth sensitivity occurs. To avoid this problem, choose a mild teeth whitening kit. Find one with a low percentage of peroxide. 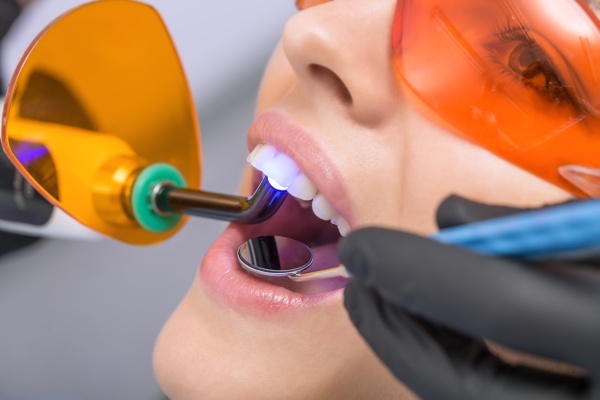 Have the dentist prescribe a teeth whitening regimen that uses a mild bleaching agent, even if it will take longer for the discoloration to fade. Immediately after using a home whitening kit, soak the teeth by filling a teeth tray with fluoride or sensitivity toothpaste, and then wear it for 20 minutes. The soak will help to fortify the teeth by building up the enamel and by stopping sensation from reaching the tooth's nerve. With a little planning, you can make your teeth whitening experience comfortable and free of pain. Just ask the dentist for guidance in your efforts to prevent teeth sensitivity. Are you ready to have whiter teeth? Request an appointment here: http://www.yourdowntownmckinneydentist.com or call Sam Patel DDS, PA at (972) 638-5848 for an appointment in our McKinney office.